Portugal doesn't get much credit for seemingly any of her accomplishments, but they are substantial, particularly in art. These absolutely lovely violin sonatas from two composers who worked in the 20th century not only rectify this oversight, they add unquestionably to an already rich violin repertoire. Monteiro and Santos have had my attention for quite some time now, this 2010 release is simply another success in a line of great releases. I've admired their artistry, but it really is a treat to hear them in music that is so clearly close to them. 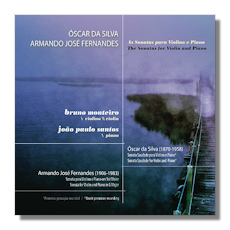 Bruno Monteiro makes both sonatas sing. The Da Silva sonata is a new to disc, and deserves to be recorded about 20 more times. It's a wonderfully crafted work, full of lush tunes and some passionate emotion. It's quite old fashioned, in the sense that it could easily be an earlier work, and so the score isn't earth-shattering or revolutionary. But for a composer born in 1870, it makes sense. The melodies, especially in the Andante, are divine, full of life and color. Monteiro contributes his usual depth of feeling with an added jolt of energy. If anything, his unique timbres suit this music especially well. Your eyebrows might raise at his tone, but there's no denying that it's exactly the sound the man wants. He's aided as usual by Santos, a great artist in his own right, and a big reason why all of these discs have been so worthwhile. The sonata by Fernandes (1906-1983) is completely different in mood and style. It's still very beautiful, but also more blatantly modern. Monteiro and Santos seemingly relish the challenge, balancing the work's loveliness with its more emotionally ambiguous nature. After the Silva, the Fernandes might seem a bit shocking. Monteiro is the voice that pushes the sonata forward, but Santos provides a rock-solid backdrop on which to paint the work. The highlight for me is undoubtedly the mysterious and effortlessly spun third movement, in which these two artists almost lovingly duet. It's well worth having for this alone. A fine achievement, one that will introduce you to music you didn't even know existed.